Many great things can be found in Switzerland. Impeccable watches. Meltingly good cheese fondue. And Lausanne, the archaic yet energetic city sprawled next to Lac Léman. Lausanne attracts everyone from sport lovers to gourmands, combining pristine Swiss heritage with cosmopolitan culture. Located in the French speaking part of Switzerland, this lakeside city is only a short ferry away from both Geneva and France’s Évian-les-Bains. In fact, many workers commute across the water each morning. Pack your walking shoes. It’s built on the southern slope of the Swiss plateau, with a difference of about 500 metres between the lakeshore at Ouchy and its northern Medieval cité edge. At least you’ll burn off the cheese. There’s plenty of ways to help combat the hills with escalators, lifts and steps – plus the timely Metro M2 line which zooms driver-free around the city. A blend of medieval buildings, 18th century architecture and an intriguing youthful spirit, here’s how to spend a weekend sight-seeing, savouring and strolling through its cobbled streets. There’s one word to sum up this hotel – opulent. A striking building with regal turrets spiralling up into the sky, the downstairs lobby is filled with interesting artwork and dramatic chandeliers. Rooms are sleek and spacious – but it’s the black marple spa that sparks awe here. Step this way, sauna fans. Location is this hotel’s crown. Found in the heart of the city centre, shops, cafes, the historical district and bars are all on Hôtel des Voyageurs’ doorstep. The 35 rooms offer understated chic, with large beds, pretty terraces and art deco touches. Dating back to the 1850s, the Beau-Rivage Palace was a magnet for high society in its early years. Located in the former fishing harbour district of Ouchy, it’s only steps away from the water and the Olympic museum. Don’t forget to ask the front desk for a glimpse of the hotel’s famous guest book – turn its pages to spot signatures of everyone from Coco Chanel to prime ministers. Championing local produce, La Brasserie de Montbenon offers uninterrupted views across the water and a menu brimming with fresh, delectable options. Feast on everything from lake trout salad to entrecôte beef. Housed in a centre for culture, it’s unsurprising that it’s a buzzy and loud spot, with the terrace packed full of well-dressed chatting diners. Sitting rather inconspicuously on the end of a narrow street is Pinte Besson, one of the city’s oldest restaurant. Set up by a wine merchant in 1780, a meal here is like stepping back in time. Stained glass windows, a little wooden bar and a classic Swiss menu. If you’re after a fondue fix, this is where to find it. There’s also fresh fish, meats and thirst-quenching local wines to sample too. Book ahead, as it’s packed with locals in the evenings. Gourmands should plate a park at La Table d’Edgard, the exquisite restaurant boasting a Michelin-starred menu with a Mediterrranean edge. If courses of tender lobster salad and truffle-sprinkled dishes don’t whet your appetite, the extraordinary view across the Alps certainly will. There’s plenty to explore in Lausanne. Must-tries include a visit to The Olympic Museum for exhibitions on sport and International Olympic Committee (it is the ‘Olympic Capital’ after all). Chocolate fans can master the craft at Durig by trying a workshop in making your very own edible animal. Organic and fair-trade, the smooth chocolate is made with pure cocoa butter – ensuring far too tempting results. Classes run regularly throughout the month as part of city tours, with bookings essential. No visit to Switzerland could possibly be complete without a taste of its wine. With as little as 1% exported, it’s a secret worth sipping. Catch the train to Grandvaux to spend the afternoon at Domaine Croix-Duplex, a picturesque family-run winery offering Vaud wines and heaving cheese platters. Enjoy a wine tasting on its vine-decked terrace – the views across the water are mesmerising. Post-glug, make your way down through the beautiful vineyards to the little town of Cully and catch the steam boat back to Lausanne. Don’t dawdle though, there’s only three boats a day. Charming, energetic and full of fascination – meet your favourite new city break. Hungry for more? Visit www.lausanne-tourisme.ch to start the adventure. A site for the style seekers, The Wordrobe is a luxury online travel and food magazine. Explore world-class destinations, discover iconic hotels, try delicious recipes and find must-try events. Recently I discovered an absolute new gem of a mini break destination: the city of Lausanne in Switzerland. 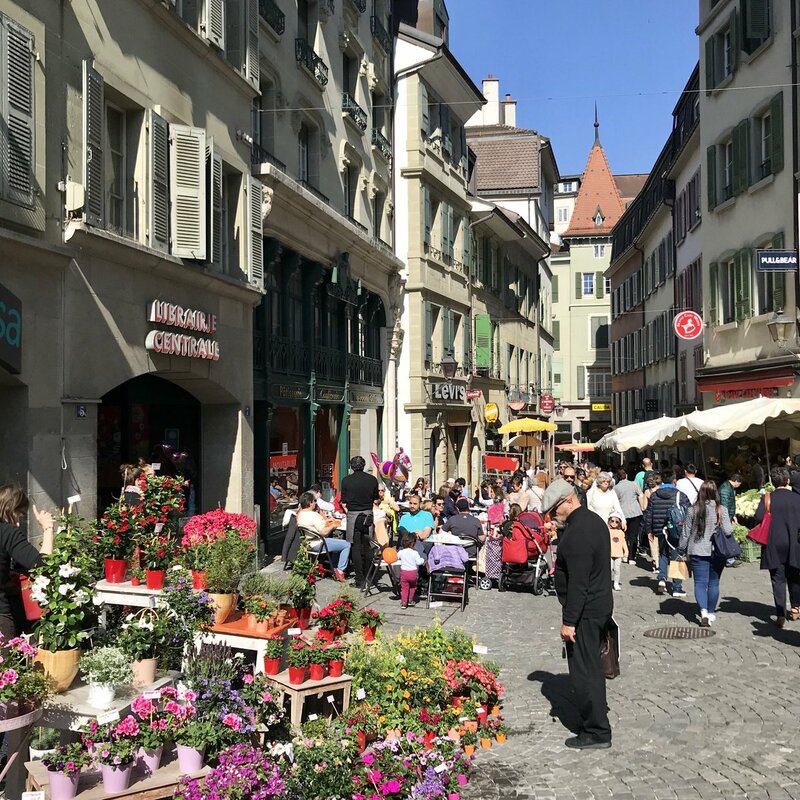 Lausanne, Switzerland – Where to eat ! No destination makes it to my shortlist without offering a full eating plan and Lausanne in French speaking Switzerland is no exception.